While Google introduces new products, experiments and concepts such as Google Glass and Art, Copy & Code they say goodbye to smaller yet popular and go-to applications such as Google Reader. 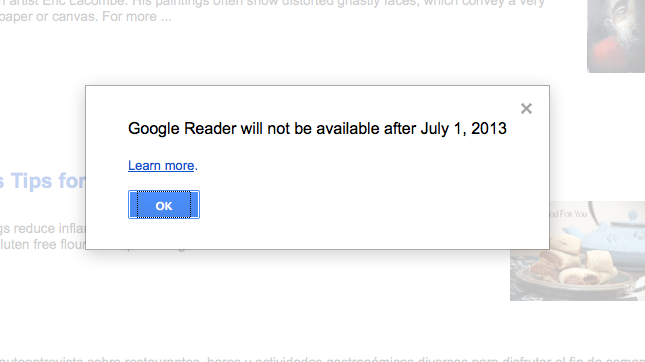 Google has announced that July 1st, 2013 Google Reader will cease to exist. They have provided users with instructions as to how to save their collected blogs and transport them seamlessly to other web readers. Apparently the use of RSS has gone down in the past years, being substituted by Flipboard or Twitter. Google is listening to web statistics and making some unexpected changes for the users. Nevertheless, this shoudn´t be an extremely impactful change due to the existance of many alternative RSS and Atom file readers on the web. This entry was posted on March 15, 2013 by mcquant in News, Uncategorized and tagged Atom files, Google, google reader, reader, RSS.